Who Is That Man? In Search of the Real Bob Dylan is more a psychological analysis than a biography. It presumes that the reader already has a firm grasp of its subject—Dylan’s life story, the supporting characters, and the changing times in which he lived. The reader should also be aware of additional costs that come with reading this study because David Dalton takes each of Dylan’s albums in his hands, holds it up to the light, and turns it at different angles to look for clues about his subject’s state of mind. It is not just the lyrics that are dissected, but the guitar chord changes, the linear notes, and even the pictures used on the album cover. If you don’t already have them in your collection there is a serious temptation to go out and buy them, or in the case of this reviewer rebuy them, to compare notes with the author (musical and written). Mr. Dalton contends that each Dylan album brought with it not only a change in musical style but a change in persona—the protest singer of The Times They Are a Changin’, the Rimbaudian beat poet with electric guitar who released Highway 61 Revisited, the trippy hippy from Blonde on Blonde, the country singer from Nashville Skyline, the abandoned husband of Blood on Tracks, and the Saved born-again preacher, etc. Then there are the films he made, Renaldo and Clara and Don’t Look Back, his novel Tarantula, and autobiography Chronicles Volume I. It is not a new thesis and has already been explored in the film I’m Not There in which different actors, including Christian Bale, Heath Ledger, Richard Gere, and Cate Blanchett portrayed different phases of Dylan’s public persona. Mr. Dalton takes Dylan’s self-spun mythology by the throat in a bid to strangle out the truth. When he arrived in New York in the early 60s Dylan claimed to have visited Woody Guthrie on his deathbed and been given his blessing to become his musical successor. Not true, insists Mr. Dalton saying that Guthrie would have been so ill at the time Dylan said he had visited him that he could hardly recognize his own family. For years Dylan claimed that he was an orphan, even though his parents were alive and well and even attending his concerts. The motorcycle crash that nearly claimed his life in 1966 was no more than a tumble that Dylan exaggerated, claims author Dalton, firstly to create a new level of mystique but also as an excuse to withdraw from public attention. The main focus of Who Is That Man? is the iconic Dylan of the mid-1960s—the one who wrote “Mr. Tambourine Man,” “Like a Rolling Stone,” and “I Want You”—and who, according to Mr. Dalton, spent the following decades trying to flee. The Dylan of the 1970s, the country singer and ex-Jewish born-again Christian also come under close scrutiny, but the 80s, 90s, and OOs are skipped over. Nonetheless, the portrait that emerges is no less interesting. 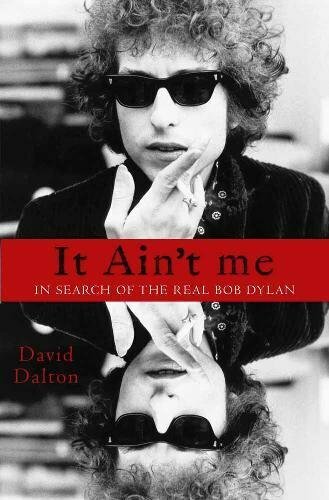 Mr. Dalton’s stated task of discovering the true nature of the man behind the multiple personas ultimately proves to be fruitless as he concludes Dylan himself could probably not untangle the fabrications, self-mythologizing, and urban legends that have grown around him from who he truly is. That does not devalue this study. Who Is That Man? is a superb dissection of one of the most enigmatic figures in modern music.